Manuel Antonio is known for its spectacular natural beauty, and Manuel Antonio National Park consistently ranks as one of the country’s most visited. Manuel Antonio is also one of Costa Rica’s hottest – and friendliest – destinations for LGBT travelers. Manuel Antonio is the Central Pacific’s go-to destination for all things outdoors: nature hikes, snorkeling, wildlife watching, extreme adventures, and many more tours and activites. The eponymous Manuel Antonio National Park is spectacularly idyllic and postcard-perfect, with emerald rainforests that spill onto fine sands that wash into turquoise ocean. Manuel Antonio is more tourist strip than town – hotels, restaurants and points of interest blaze a trail from the Pacific Ocean four miles north to downtown Quepos. As the winding road climbs to nearly 100 feet above sea level, find many upscale hotels and restaurants with spectacular, panoramic ocean views. And if you’re lucky (and you’ll probably get lucky) the roadside view will also include sudden spottings of three-toed sloths, curious coatimundis, and two subspecies of the endangered Central American squirrel monkey. But if you’re a wildlife watching aficionado, don’t leave it up to serendipity; head to the national park, home to hundreds of birds, mammals, reptiles and amphibians! 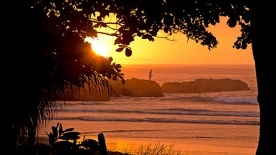 Gorgeous scenery is Manuel Antonio’s main claim to fame. The area’s spectacular beaches–and there are more than half a dozen of them–hug the serpentine coastline, creating quiet nooks and natural swimming pools. Some of the most private, beautiful beaches are nestled within Manuel Antonio National Park ($16 park entrance fee), but freebie sands are also spectacular–just a little packed with eager sunbathers. People-watching is top-notch at Playa Espadilla, a stretch of popular beach located just outside the park’s entrance. Costa Rica is one of Latin America’s most popular destinations for gay travel, and Manuel Antonio is one of the nation’s friendliest locales. Several resorts and upscale hotels in the area cater to the LGBT crowd, and most businesses are very welcoming. Ballena National Marine Park, a whale-watching paradise! Carara National Park, a haven for scarlet macaws. Whitewater rafting on the Savegre or Naranjo River. Sport Fishing in Manuel Antonio and Quepos – take your pick of estuary, inshore, or offshore adventures. Nauyaca Waterfalls on a spectacular horseback ride through the wilds of Dominical. Manuel Antonio National Park is the undisputed capital for wildlife in the region. The park and its surrounds are home to hundreds of animal species, including an astounding 100+ mammals: three-toed sloths, howler monkeys, coatimundis, and white-faced capuchin monkeys among them. 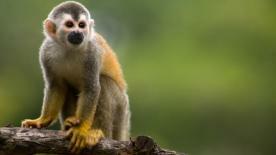 The park is also the only remaining home for one of two subspecies of the highly endangered Central American squirrel monkey; the other subspecies shares its range between Manuel Antonio and Corcovado National Park on Costa Rica’s isolated Osa Peninsula. There’s always something to see and do in Manuel Antonio. The town’s enviable location on the Central Pacific ensures good weather year-round, although there are distinct dry and rainy (green) seasons. The driest months run mid-November through April, and the green season lasts from May to mid-November. During the wettest months, expect daily afternoon showers, often with thunder and lightening. “Shoulder” season–the transitional weeks in November and April–are a great time to visit, since the countryside is lush and green but the rains have mostly abated. 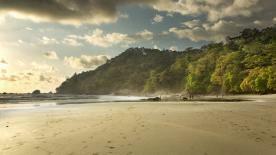 Manuel Antonio is a very popular tourist destination, and thus caters to every budget. From $10 dorm beds to luxuries that cost $500+ per night, you’re sure to find it here. If you’re planning a family trip, we recommend watching our Guide to Family Travel in Costa Rica. Tara Cabatingan, our Travel Consultant discusses details of planning a family vacation with Rodo Alvarez, Costa Rica Expert, where they also share insights on hotels in Manuel Antonio area. Generally speaking, the best deals are in Quepos, although some hostels dot the road winding down to Manuel Antonio National Park. 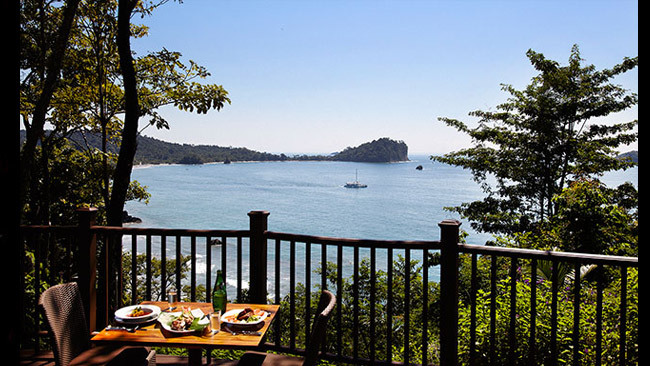 Mid-range accommodations are sprinkled over the hillside, while many of the region’s upscale choices are perched high on the hill, to take advantage of Manuel Antonio’s best views. Most mid-range and upscale hotels offer free shuttles down to the park and beach, so they are convenient even without a vehicle. You won’t want for dining options in Manuel Antonio. From Costa Rican casados to artful fusion cuisine, the town never fails to satisfy your cravings. Street vendors even service the popular beaches, offering everything from fresh agua de pipa (coconut water) to green mango and hot dogs. When you visit the area, don’t miss one of Manuel Antonio’s most iconic restaurants, El Avión (“The Airplane”). This a mid-range restaurant is housed in the fuselage of an 1980s-era Fairchild C-123 airplane that once blended scandal, intrigue, and U.S.-Sandinista relations. El Avión make history delicious–and boasts a spectacular view! Manuel Antonio is historically referred to as ‘the sportfishing capital of Costa Rica.’ The entire area of Manuel Antonio is actually located in a huge cove along the Costa Rica’s Central Pacific Coast so the sea conditions are nearly always calm and ideal for fishing. Add to that the brand new Marina Pez Vela and you have made an already popular sport fishing destination that much more successful. Besides the beautiful natural attractions found in Manuel Antonio, sport fishermen from all over the world flock here to experience the world-class fishing found in these waters. Just twenty miles from shore you’ll see the depth sounder go from 200 ft to 1,000-2,000 ft and you’ll know you are at the continental shelf, where the off-shore fishing grounds begin. Sailfish are so abundant that there are several billfish tournaments held each year in Manuel Antonio, including the annual Harry Gray fly fishing tournament in which the top boats gather to fly fish for sailfish and marlin for three days. The new Marina Pez Vela is bringing even more attention to the area as they hosted their first billfish tournament in 2012. While famous for its year round billfishing, Manuel Antonio also has outstanding in-shore fishing as well. With several rocky islands and rivers emptying from the national park this is a prime spot for snapper, grouper, jacks, mackerel, sea bass, and, of course, roosterfish. If you like, you can even fish for giant snook in the two river mouths that empty into the Pacific Ocean from the national park. Public transportation: Frequent buses run San José-Manuel Antonio, and also between Quepos and Manuel Antonio. Taxis are prevalent. Public amenities: There are public bathrooms, showers, and water fountains within Manuel Antonio National Park. Shopping: Shopping is abundant, from larger grocery stores to roadside fruit stands. Open-air souvenir shops abound. Gas stations: There is a full-service gas station in downtown Quepos. WiFi or Internet cafés: Many mid-range and upscale hotels and restaurants offer free WiFi; Internet cafés can also be found in downtown Quepos. Cell Phone Reception: Good in most places. Restaurants: There are many options to suit all budgets.